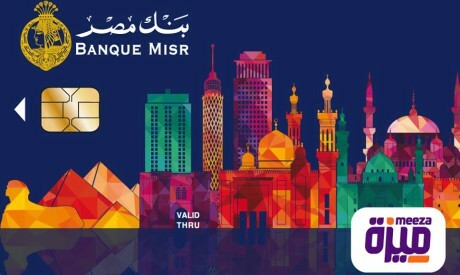 The new national e-payment card Meeza (meaning “merit” in Arabic) is being released onto the market through the National Bank of Egypt (NBE) and Banque Misr and will soon be rolled out at other banks such as Banque du Caire. Meeza is the latest financial inclusion initiative by the Central Bank of Egypt (CBE) to push towards more cashless payments in Egypt. The prepaid card can be recharged through the banks or ATMs as many times as its holder desires before it expires. Only an ID is required to issue the card — people 16 years or older can access Meeza cards — and it is exempted from administrative fees for the first month. An NBE statement explained that Meeza would be available at all its branches in the second half of January to serve the needs of a wide stratum of people. Fees after the first month are set at LE25, according to the NBE. People can also use the Meeza card without the need to open a bank account. Shopping online, making transfers and paying for different government and private-sector services are some of the merits granted to Meeza holders, who can also withdraw cash from ATMs, pay government bills, and buy from a wide network of merchants who have point-of-sale terminals. Another merit of the Meeza card is its low administrative fees, said Mohamed Al-Itribi, president of Banque Misr. This would encourage vendors to do business via the prepaid card who may avoid using others because of expensive fees, he added. Meeza provides the same services offered by Visa and MasterCard, but it can only be used locally. Its holder should also have a valid balance on the card, since it is prepaid. The card is issued by the Egyptian Banks Company in cooperation with the Ministry of Communications and Information Technology, the CBE, and a number of banks in the domestic market. Applicants can receive only one Meeza card, which is usually issued without the name of its holder printed on it unless the holder wishes otherwise, in which case a request is filed at the bank. The bank destroys the card if the applicant does not receive it within three months. NBE and Banque Misr plan to issue two million Meeza cards this year, starting with the prepaid cards in the first phase, followed by debit cards, and then cards to receive payments at a later stage. Five other banks will start issuing Meeza cards in 2019, including the Qatar National Bank and the Housing and Development Bank. The CBE aims to issue 20 million Meeza cards in the next three years, according to a statement by Ayman Hussein, the CBE’s deputy governor. Earlier statements made by Tarek Fayed, chairman of the board of Banque du Caire, explained that his bank was preparing to launch different types of Meeza cards at the end of January, starting with 450,000 prepaid cards to be issued throughout the year. Using Meeza cards, merchants can easily pay all their government dues, be they to the tax, customs or other authorities, said Akef Al-Maghrabi, deputy chairman of the board of Banque Misr. Since the card enjoys low fees in comparison to competing cards, hundreds of traders are likely to join the e-payment system, he added. At a later stage, Meeza can also be used to pay pensions and payments from the Takaful and Karama cash-subsidy programmes, Al-Maghrabi added, as part of the government’s plan to reduce the dependency on cash and encourage e-payments. The Ministry of Finance announced in September that Meeza cards would be able to handle all government payments, such as pensions and subsidies, within the framework of amendments to the public accounting system that dictates that all government payments should be electronically settled in 2019.